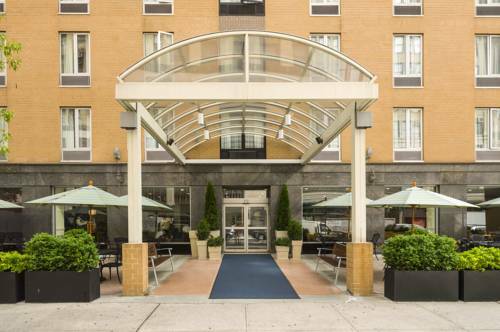 The Holiday Inn Express NYC - Chelsea hotel's location places you near major businesses and top attractions, while enjoying everything from free high-speed Internet access to a Fitness Center and a delicious, hot breakfast, which features our signature cinnamon rolls. Our hotel provides you with everything you need to stay in touch with the office, such as a Business Center that features computer access, copy and print services. In addition, our hotel is located just a short walk from Penn Plaza and the new Hudson Yards Development which hosts many of the area's businesses and major corporations. Leisure travelers are also sure to enjoy our prime location and great deals, as our hotel is close to the greatest attractions the city has to offer. We're just two blocks from Madison Square Garden, a half-mile from the Empire State Building, a few short blocks to the Highline Park and a mile from Rockefeller Center, Times Square, and the Theatre District. New American style bar and restaurant. Known for specialty cocktails and happy hour. A quick seven minute walk from the hotel, this multi story complex offers several major branded stores including Express, Lids, Victoria's Secret, Aeropostale and JcPenney. The Worlds Most Famous Arena. Hosts the New York Knicks, New York Rangers concerts and boxing. The oldest suspension bridge in the United States. Located in downtown Manhattan, offers shopping and many restaurants. Great tourist attraction for all ages. A must see in New York City. One of the most fashionable neighborhoods, offers high end boutiques and numerous restaurants. Great for the whole family, features many battleship carriers. Stop by the park to relax, have fun or maybe even see a wedding ceremony taking place. It is not recommended to visit Central Park after dark.